Guys, I’m back!!! After launching TheWholeTara Recipe App I’ve been a little MIA lately on the blog with new recipes. I wanted to get back in the game with a recipe that had the potential to be a serious new favorite, so what better than this One Bowl Wonder Curry Quinoa and Bean Burger? These one bowl meals have been so popular that I knew this one would be a hit too. I even added crunchy roasted chickpeas for a serious bang. And worry not because this recipe is super easy to make…. One order of Crunchy Quinoa Crusted Avocado Fries please! Crunchy on the outside and creamy on the inside, these healthy gluten free avocado fries are about to rock your world! They’re “breaded” using a quinoa loaf and hemp seeds, then baked until golden brown. Avocado fries are the perfect alternative to french fries and make a mouthwatering snack, especially served with this Kale-Infused White Bean Dip. 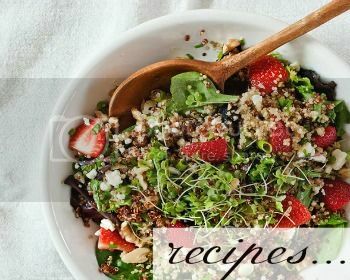 I like fruit and I like salad, and together it’s a superfood match made in heaven, cue my Summer Blueberry Quinoa Salad. This refreshing quinoa salad is dressed with a sweet blueberry lemon dressing and boasting with antioxidants and plant based protein. It’s the perfect addition to a summer BBQ, Sunday brunch, or workday lunch box…. You know that feeling when you know you really like something (enter quinoa), but when it comes down to making it you’re overwhelmed by all of the options. Well this is me when it comes to two things, quinoa and kale. Between Google, Pinterest, and Instagram, I literally can’t choose a recipe! It gets me every time, but this week I decided to call it quits and make this Quinoa, Black Bean, and Mango Salad from The Best Mexican Recipes cookbook. I don’t know about Mexican, but I do know that this was a major win over at TheWholeTara. I’m sure by now you have heard of the most popular grain of the year, quinoa (pronounced keen-wa)! Contrary to popular belief quinoa is actually a seed, with a ton of benefits for your waistline and wallet!